Today we are going to make homemade spaghetti and meatballs. I am going to teach you how to cook your pasta perfectly so it soaks up flavor from the cooking water and the sauce. 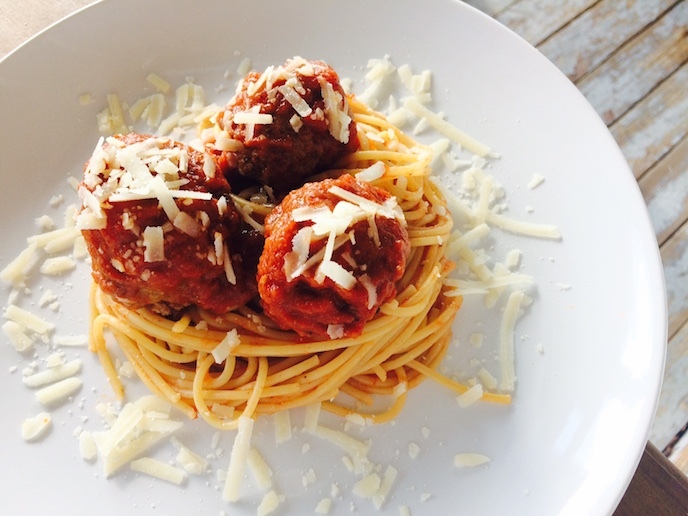 I am also going to show you how to make meatballs that will stay moist and burst with flavor. You can use homemade sauce or your favorite jarred marinara. I would say that this is something you do not want to skimp out on. A good sauce will make or break this dish. 1. Place the first 6 ingredients into a medium bowl and mix well. Let this sit for 15 minutes. This mixture is going to season the meatballs and keep them light and moist while you simmer them. 2. Place the beef into the bowl, and then squeeze the sausage out of it's casing and into the bowl. Mix everything together until just incorporated. The beef adds beefy flavor and the sausage is going to give you pork flavor and add extra Italian seasoning to the meatballs. Do not over mix this mixture or you will have heavy meatballs. 3. Take a 1/3 cup scoops of the meat mixture, lightly roll into even balls and then place on a plate. The scoop size is up to you, but I like my meatballs to be manageable size while I brown them. 4. Heat a large skillet over medium heat, add the olive oil and when it smokes, gently place the meatballs into the skillet. Cook for 4 minutes and then turn the meatballs over and repeat. Browning the meatballs is very important and is a big step in adding huge layer of beefy flavor to the recipe. You are just browning the beef and it will not be cooked through. 5. Place the meatballs into a medium saucepan, add the marinara and cover. Simmer for 30 minutes on low heat. This will cook the meat balls though and incorporate the flavor of the meat ball to the sauce and vice versa. 6. Bring a large pot of water to a boil and add the salt. Add the pasta, stir well and cook for 9-10 minutes. Drain the pasta and save 1 cup of the pasta water. Do not rinse the pasta. The boiling, salted water will cook your pasta to exact doneness and season it well enough for your to actually taste the pasta goodness. The starchy pasta water will help thicken the sauce in the next step as well as the hot pasta. 7. Place the hot pasta water and 1.5 cups of the simmering marinara sauce back into the pot and bring to a simmer. Add the pasta to the light sauce and toss well, cook until the pasta soaks in the sauce. Finishing the pasta in the sauce helps to soak in further flavor. 8. Place the pasta into a bowl and top with meatballs and extra sauce. Top with parmesan cheese and fresh pepper. Place a large skillet over medium heat and add the oil to the pan. When the oil smokes, add the sausage to the pan and brown well. Add the mushrooms, onions and peppers to the pan and sauté for 5 minutes. Add the garlic to the pan and sauté for 3 minutes. Add the next 3 ingredients, stir well and cook for 2 minutes. Add the tomatoes, water and sugar and bring to a simmer. Cover at the pasta snd cook for 15 minutes on medium heat,stirring every 3 minutes. Carefully remove the lid and stir in the basil. Pre heat the oven to 350 F and place parchment paper on a baking sheet. Lay out the tomatoes in a single layer, drizzle with olive oil and season with salt, pepper and herbs. Bake for 30 - 40 minutes or until the tomatoes begin to shrivel up. You can puree the tomatoes to create a flavorful sauce for pasta or spread on appetizers and pizza. You can also freeze for later use. 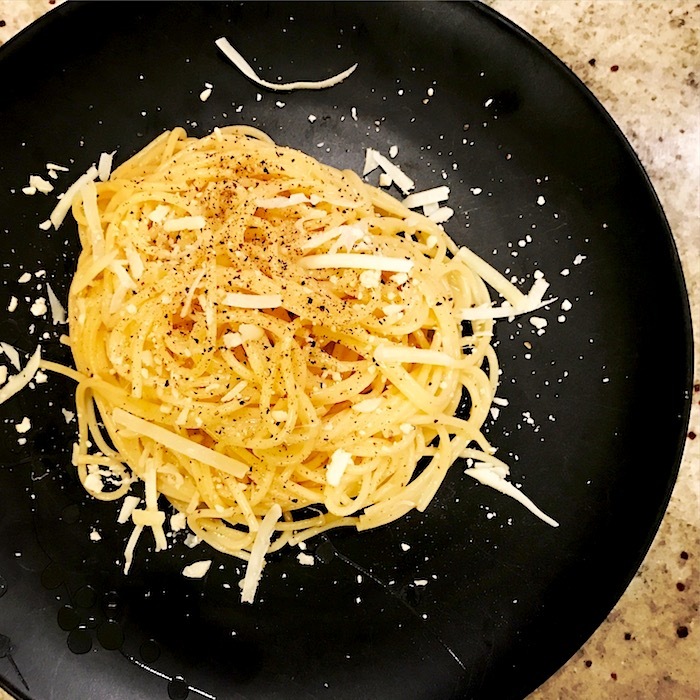 Check out this easy pasta recipe that uses some pantry staples and everyday ingredients to get big flavor. I created this one day as I was whipping up some lunch by using some odds and ends in the fridge. You can add any kind of vegetables you like and can switch out the ham for bacon or any kind of lunch meat like smoked turkey, salami or roast beef. Bring a large pot of salted water to a boil, cook the pasta for one minute less than directed. Place a large skillet over medium heat. Add the oil to the pan, when it smokes sauté the asparagus and ham for 2 minutes, add the garlic and cook for one minute then turn off the heat. When the pasta is done, turn the heat back on the asparagus, add the pasta and 1/2 cup of the pasta water to the pan and toss. Add the cheese, lemon, salt and pepper, toss well and serve immediately. Heat a small saucepan or skillet over medium heat, add the bacon and cook until crisp. Add the onions, cook until soft then add the garlic and and cook for one minute. Add the tomatoes, wine or stock and sugar to the pan. Cover the sauce and simmer on low heat until the tomatoes break down, about 15 minutes. Season with salt and pepper. Place the pasta in a pot of boiling, salted water and cook for 2 minutes less the the instructions read. Add the pasta and 1/2 C of the pasta water to the tomato sauce. Simmer the pasta for 3 minutes or until the sauce soaks into the pasta then stir in the basil. Boil a large pot of salted water; cook the pasta until al dente. While the pasta is cooking, place a large skillet over medium heat. Add the to the pan and sauté the onion until soft. Add the sausage and garlic to the pan and sauté until golden brown. Add the tomato and chili flakes and simmer until the tomatoes break down. Stir in the cream and season with salt and pepper. Add the pasta and basil to the pan and toss to coat.